Add warmth and elegance to any room of your home with the right floors. If you are searching for floors that are both attractive and durable, you can’t go wrong by choosing hardwood flooring. These floors offer an elegant appeal that makes every space inviting and attractive. Give your house a wall-to-wall makeover by choosing our flooring company for your engineered, solid, or handscraped hardwood flooring needs. Our team of professionals helps you through every step of the upcoming flooring project. From selection to hardwood flooring installation, you can depend on us to ensure you end up with the flooring that you desire and expect. At our well-stocked showroom, we house a full selection of hardwood in all designs, colors, and price ranges. With hundreds of stores included in our franchise network, we use our significant buying power to your advantage. This allows us to deliver great flooring options at a great price, no matter what type of planks you have in mind. See for yourself by visiting our flooring store to start the process of creating a whole new look in your home. Strip Flooring: Adds a traditional look while making the overall space seem larger. Strip flooring comes in strips that range from 1" to 2.5" wide and 5/16" to 3/4" thick. This floor product offers a unique style and works well in small areas too. Strip flooring is often the preferred style for historic houses with wood floors. Plank Flooring: Consists of wide strips from 3" to 8". This flooring is recognized for its modern look and rustic appeal. It effectively complements a wide range of interior designs across spaces both large and small. This type of flooring is easy to install because there are fewer seams to match. Plank has now become one of the leading flooring choices for local designers, architects, and homeowners. 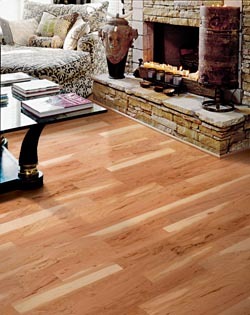 Handscraped Hardwood: Offers the timeless, traditional look that is popular among many homeowners in our area. Handscraping is a time-tested technique used for finishing wood. This delivers a rustic look that offers the distinctive character you desire. The flooring is made to look as visually appealing as traditional flooring, but with modern finishes that provide extra protection from wear and tear. Wire-Brushed Hardwood: Delivers unique style with old-time charm. By applying modern technology to old-fashioned techniques, wire brushing scrapes off the soft top layer of wood. Exposing the hardwood grains produces noticeably varied and tough flooring that allows small scrapes from everyday living to add to its character. Dreading the prospect of shopping for new floors? Visit our location for a selection experience that is both easy and enjoyable. We keep a group of knowledge flooring associates ready to assist you whenever you’re ready to shop. One of these specialists will take the time to understand your expectations in hardwood price, performance, and appearance. This allows us to narrow down the vast selection of wood we carry, as well as make professional recommendations that put you one step closer to choosing the hardwood of your dreams. As soon as you make a purchase, we’ll immediately schedule a time for installation. Advances in manufacturing make the most popular hardwood products more durable than ever before. Traditional solid hardwood is a popular option because it can be refinished years down the road in order to produce a like-new appearance. While this makes solid planks a great choice for countless homes, engineered hardwood may be more practical for your household. Engineered wood features layers of a plywood-like material topped with a thin veneer of real wood. This means engineered planks look and feel like your favorite solid styles, but are able to resist wear and tear more effectively. While engineered products cannot be refinished, they are the ideal choice for areas the encounter frequent moisture, such as bathrooms, kitchens, and basements. Polish your floors every couple of months with a urethane product. Urethane polish is safe for your floors, dries quickly, and adds a protective layer. Protect your flooring from dirt and moisture with doormats inside and outside of the house. Use an area rug as a decorative accent for extra protection in certain areas of your home. This is especially helpful near sinks and underneath dining room tables. Keep your dog’s nails trimmed to protect your floors from scratches. Ensure your new floors satisfy in all respects by backing your purchase with professional installation. When placed properly, hardwood floors add value to your home and improve the overall ambiance of living areas. Allow us to perform the hardwood flooring installation on your behalf and get outstanding flooring sooner than you ever thought possible. The team of technicians we employ implement the most reliable installation techniques and tools on a daily basis. By utilizing years of experience, they complete extensive installation jobs with speed and skill. We remain so confident in the work of our in-house installers that we support their workmanship with guarantees and warrantees unparalleled throughout the industry. We stand by our promise to you when you choose a product. With this in mind, you can feel confident depending on our flooring company for quality installation services and beautiful hardwood floors. Choose one of our star rated products and get the peace of mind you deserve. Our flooring business remains committed to the complete satisfaction of clients, which is why we offer a number of impressive warranties. Depending on the rating of the product you purchase, you may get to take advantage of one or more of the beneficial guarantees available. One of the most popular warranties we offer is the Confidence Plus Warranty. According to the warranty, if you aren’t satisfied with your new hardwood flooring for any reason, we’ll replace it with a comparable product free of charge. All you have to do is consult us within 30 days of the initial installation. Contact us today when you need more information about our engineered and solid hardwood flooring options. We perform hardwood flooring installation for customers throughout Fort Dodge, Webster City, Humboldt, Eagle Grove, Algona, Rockwell City, and Storm Lake, Iowa.